What do scorching temperatures, no school, and a slower workload all have in common? They’re all great reasons to book a much-needed vacation. But while the prospect of travel sounds alluring, the jet lag associated with it is not. You can, however, minimize the effects of jet lag so you can maximize your time away from home. 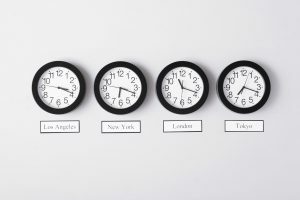 Jet Lag is caused by the disruption of melatonin (a hormone responsible for our sleep-wake cycle) when you cross time zones. It includes a disruption of biological rhythms, which then leads to disruption of other hormones that work on a circadian rhythm (aka your body clock). These hormones regulate sleep, digestion, concentration, bowel habits and more. Translation: Jet lag turns you into a blob of room temperature “Jello”. Expect one or two days for your mind and body to feel normal again. ›› You feel general discomforts such as nausea, headache and muscle soreness. ›› Your sleep is disrupted from the imbalance in the secretion of melatonin. ›› You’re having difficulty concentrating or performing normal activities. ›› You’re experiencing moodiness, irritability, and nervousness. While still at home, you can transition yourself into your impending time zone. Go to bed an hour earlier each day a few days ahead of your flight (depending on the time difference). This is easier when you avoid stimulation and bright light a few hours before going to bed. Bring some artificial light into your room to help with waking up. By the time you leave home, your body should be more in sync with the time zone of your destination. This tip is especially crucial when traveling with your little ones. I used to think traveling with children was only hard because of the plane ride—HA! Now I know that the plane is a cakewalk compared to those sleepless nights abroad. And guess what? When your little ones don’t sleep, YOU don’t sleep. One thing we aren’t consuming enough when traveling is water. Couple this with an increase in high-sodium foods and a low-humidity environment in flight, it’s easy to become dehydrated. An empty water bottle can go through security, so fill up once you’re in the terminal or grab a few bottles right before you board. That’s one less thing to rebound from when you land. Ease off the caffeinated beverages. This may sound like a no-brainer, but when you’re wiped by the flight yet it’s barely morning where you’ve landed, common sense goes out the window as you order cappuccinos throughout the day to offset your drowsiness. Remember, caffeine makes it difficult to fall asleep and compromises your sleep quality. A good rule of thumb: Avoid pick-me-ups at least six hours prior to bedtime. 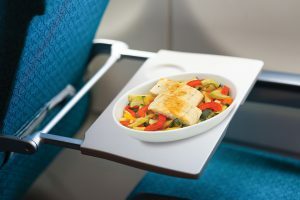 Following the Zone Diet, especially during the flight, can minimize hormonal changes. It’s very easy to overconsume carbs with airline meals, snacks, and even alcohol during the flight resulting in unstable blood sugar levels. Bummer, right? But alcohol can make for a frustrating sleep cycle. It knocks you out, only to wake you up a few hours later with a case of dehydration and caffeinated insomnia. Exposure to natural sunlight can help restore circadian rhythms (your body clock) since it’s one of the main factors that influence the body’s biological cycles. For travel to the west, enjoy the late afternoon sunlight. If you’re traveling to the east, bask in the morning sunlight. A daily regimen of high-dose fish oil can help melatonin restore its natural rhythm whereas a deficiency of omega-3 fatty acids disturbs melatonin1. Don’t let them know there is a time change. If it is your normal at-home nap or bedtime in your new destination’s time zone, lay them down. To make the transition easier, follow all the sleepy-time rituals you would at home—bottle beforehand, white noise, book. Bring ready-made or makeshift blackout blinds for travel to create the illusion that it’s nighttime and therefore bedtime. If you follow these guidelines, I guarantee you won’t need a vacation from your next vacation. Let us know if these tips work for you, or if you have any of your own jet lag remedies in the comments below.